A 36 year-old widow in Kenya last Thursday hacked her lover with a machete and left him dead in a pool of blood. The suspect Martha Mukatisila Emoit. PHOTO | GERALD BWISAAccording to Kenyan news media, the suspect Martha Mukatisila Emoit, had confronted the man with accusations of infidelity. The couple had picked a quarrel at a pub in Eldoret town, road block area, at around 8pm. During the heated quarrel, Martha attacked the man with a sharp machete, inflicting several deep cuts on the head before escaping. “She was breathing heavily when she confronted her boyfriend at the pub. No one attempted to approach her since she was holding a sharp machete,” an eyewitness Mr Joseph Wambulwa said.“Afterwards an argument erupted prompting her to slash him on the head before taking off.”Furious residents quickly rushed to her home and set it ablaze following the incident. The Eldoret fire brigade together with police arrived at the scene and subdued the fire. A manhunt was immediately launched that led to the arrest of the woman deep in the night. The body of the deceased was taken to Moi Teaching and Referral Hospital (MTRH) mortuary. Confirming the incident, Eldoret West OCPD Tom Achiya said investigations are ongoing. 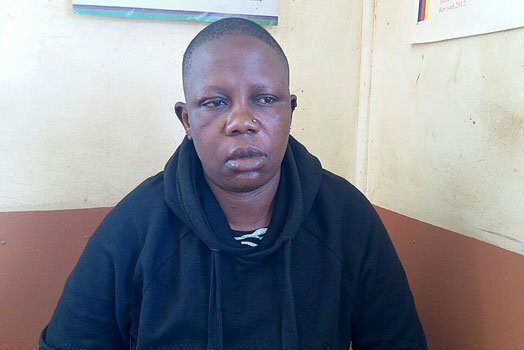 “This is a serious case and once investigations are completed we will charge her with murder,” said Mr Achiya.The woman is currently being held at Baharini Police post in Eldoret West.